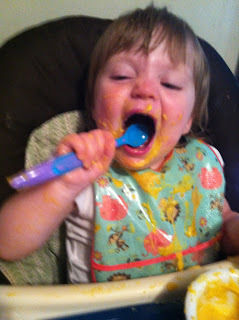 Daily Adventures of the SAHM: Butternut squash soup - your husband might not like it, but your kid will. 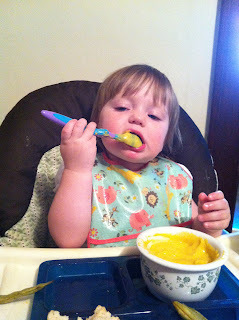 Butternut squash soup - your husband might not like it, but your kid will. I had a beautiful, large butternut squash and since I've been dealing with a sickly child for the last week straight, I figured a hearty soup is exactly what we needed to help get her back on the road to recovery. I went through several recipes and was sort of... disappointed(?) at just how easy it is to make squash soup. I think I figured it would actually take some elbow grease. Whatever. I'm weird sometimes about cooking. After looking at several recipes and reviews, I decided to just wing it. I rubbed olive oil and a little onion powder on the squash and then roasted it at 375 degrees (f) for an hour, when the meat inside was tender. 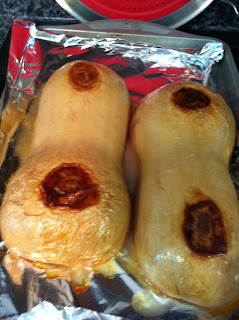 Obviously depending on the size of your squash, you'll want to bake it for more or less time. After the squash was fully baked, I let it cool for about 15-20 minutes and then scooped the meat out and threw it in my blender. 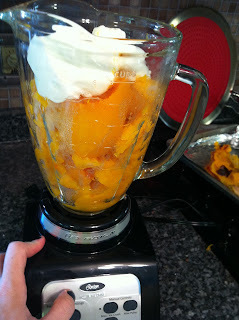 Unfortunately, I don't have a decent sized food-processor, but the blender gets the job done. I wanted the soup creamy, so I added a single serving of plain Greek yogurt. Protein and all that. Bla bla... Please disregard my chipped navy polish. I love matte top-coat but the polish only lasts, like, a day. Anywho, I added the yogurt to the squash. I also threw in about a half teaspoon of celery salt, a teaspoon of sage seasoning, some garlic powder and a sprinkle of sea salt and then pureed the crap out of my concoction. After heating it up, I served some up for E (and some for the husband and me). Brett immediately turned his nose up at dinner. He said the soup smelled like goat cheese (no goats or cheese were added to said soup) and it was unappetizing to him. He did go crazy for the beer bread and spicy baked green beans I threw together this evening. Emma was hesitant to try the soup. But then she decided she liked it. Your first picture of the squash, caught my attention and took me a minite to realize it was said squash! :) That being said, recipe sounds yummy and I will definitly be trying. I love soups in the fall!!! Great pics of Emma too! 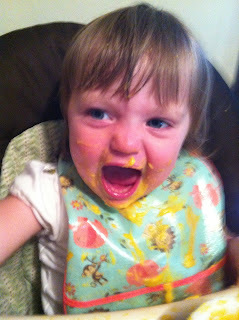 I love messy eating pics!